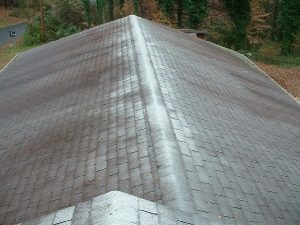 Why Does My Roof Look So Dirty? 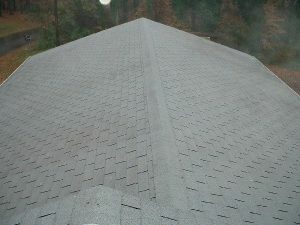 Do you find yourself looking at your roof and asking these questions: Are the shingles deteriorating? Is our roof being eaten by mold? What is causing those ugly black streaks? You’re not alone – black streaks, mold and algae will attack most roofs if left untreated. The black streaks on your roof are most likely the prehistoric algae known as Gloecapsa Magma. These spores love moisture and typically will start to grow on the north or shaded side of your roof. And what makes it worse, this strain of algae travels though air, so if someone in your neighborhood has black streaks, chances are good, you will eventually have them too. According to the Asphalt Roofing Manufacturers Association (ARMA) the algae is mostly an aesthetic nuisance, although over time, the moisture retained in the algae can prematurely age the singles and contribute to moss or lichen growth that will physically deteriorate your shingle. You no longer have to live with a dirty, moss or algae covered roof. Sparkle Wash also offers Soft Wash Roof Cleaning. After much testing, we found the soft wash technique is gentler on you roof and removes dirt, grime and mold safely. 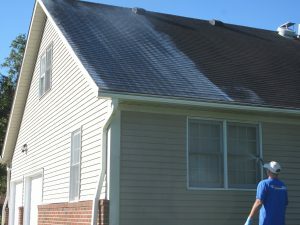 Having a professional power washing clean your roof is a lot more cost effective than replacing the shingles. Like other areas around your house and property, proper cleaning and maintenance will add value and curb appeal to your home.